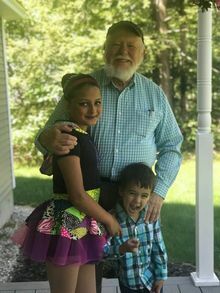 A memorial service for family and friends to celebrate his life was held on Saturday, April 20, 2019 at the First Congregational Church, 508 Union St., Manchester, NH. The University of New Hampshire Manchester held a commemoration for students and colleagues on Friday, February 22, 2019. Michael brought joy to my life. I miss him. God bless you, Michael! You led a good and virtuous life to which many of us can only aspire. I was very privileged to have Michael as the best man at my wedding, even though he said he didn't do weddings! I also spent two very enjoyable and funny summers sharing an apartment with him in Durham, New Hampshire. He was so modest about his accomplishments, but he led a life of deep service to other. He always was a man of modest needs and had a never-failing sense of humour and an innate kindness. "God rest him all road ever he offended!" I and a number of my colleagues at Canterbury Shaker Village had the great privilege of knowing Michael as a co-worker and friend. His wonderful sense of humor, immense kindness, and deep cultural knowledge made him a sheer pleasure to know and work with. Michael will be long remembered by many people who consider themselves fortunate to have known him. Michael left an indelible mark in the hearts and minds of our family and friends in Brazil. To this day, they remember him, his energy and his genuine interest in the Brazilian culture, people, food and landscape. This photo of Marian (Michael's mother) and Michael is from 2003. Of all the pictures I have of him, this is one of my favorites, not because it is a particularly good photo, but because she was clearly saying something silly as if it weren't silly, and he is laughing so hard that he couldn't even see -- one of the ways I will always remember him, and which I miss so much. I'm so sorry to hear of your loss of Mike. He was a lovely man, loved deeply by all of his family. I hope the memories you built together over his life will be comforting as you share them together in the days, weeks and time ahead.